So, what is this thing called The Fray? 1. It all started in 1987. Rick Phillis threw down on my track, the picture that would start a series of events that changed the face of slot cars. Funny thing is, we owe it all to the Tub Track. You see, when Rick was a young man, there was a store in his town of Ferndale, called The Red Store (it's still there), that just happened to have a tub track in it, where Rick first started racing slots. This led him to go out and purchase a lot of lock and joiner, and start making his own designs, but all 6 lane, and all spaghetti style. The Fray track was born. It didn't become the Fray, though, until he met me, and my Petaluma group. I got back into slots that summer in 1987, and through a series of calls, contacted Rick. Three months later he surprised me by showing up at my door, and tossing that now famous picture on my table. "You don't want that, you want this". Yes I did. I immediately went out and got enough track for my own 6 lane Fray track (for 3 tracks, eventually). Shortly after this, we began the semi-annual Invitational races, where Petaluma and Ferndale competed for bragging rights, twice a year. This went on for 7 years. Then, Rick decided to see if there was any more interest in this type of racing (the cars had evolved from their original state). He thought maybe 4 teams, 2 tables. Rick began to make calls, and fly around the country, promoting this style of racing. There was interest, all right. The first year he ended up with more than he bargained for. Four tables, 8 teams. It was a total success. I started to promote it on my, HO Slots of Petaluma site, and coined the name, The Fray in Ferndale". And that's how it all started, and has now evolved into the premier race in the world. More attendees, more tracks, more interest, and more impact than any other race in the world. It's the impact that is the most interesting. The current state of the Fray car was not imagined by Derek Brand, when he first thought of the Thunderjet in the early 60's. It has evolved into a stable, consistent, predictable piece of machinery. A thing of beauty, for something that looks a little like a skate board. We owe it to the great competitors that this race attracts, and to the aftermarket guys who manufacture the innovations. SoCal first showed up in 1998. They were confident. Determined. Assured. They got creamed. So, they went home, and immediately got to work on improving the cars. They returned the next year, confident, determined, assured. And they finished behind the leader, again. It wasn't going to happen a third year. They went home, and for the next year, threw out all the rules, and came up with the essence of the Fray car we have today. They won the fourth and fifth Frays going away. In the mean time, the Kansas City group was introduced, and they came to conquer. No way. No Freshman wins this race. You've got to pay dues to win this. And so they lost. And so they did pay. And work. And engineer. And drive a lot. And drive a lot of laps. The next two years the teams from KC dominated the Fray. It was unconditional surrender for the rest of us. We were all playing for second place from the start. So, after a one year hiatus, it brings us to this year. What did we learn? We learned how the Fray really drives this hobby, and KC may not be so assured of a victory this year. Thanks to the time honored tradition of shared knowledge in this hobby, we have all learned much from KC, and the playing field is probably a lot more equal than in recent years past. There are many more innovations and techniques that have taken the level of these cars to such a high degree that we can't believe it our selves, as we circle the tracks, how smooth and quick they are. The Fray drives this. I want to give credit to The Quad City Quarrel, and VHORS for what they do. Those are no small operations, and they are equal in quality and enjoyment to any other races in the world. Great thanks to Mike Block and Dan Luna for stepping up and hosting a race in a year that the Fray would be cancelled. Yet, if I read the pulse right, people want The Fray. They need it. It is THE event of the slot car season. The grandfather of it all is still held in high regard, and it should be. New technology, new bodies, new techniques, new competition, and New Rules should make this the best Fray ever. Most participants are seasoned, now, and we know each other well. No surprises. Or is there? Is this going to boil down to a race between the two best, as it has every year, or will there be three or four teams, any of which could pull out a victory over the other? Will there be an undefeated team this year, as there has been every year? Who's to say? I sure don't want to miss it this year, though. I think there are quite a few questions whose answers will be resolved on those gray and black tracks that will fill the Hall in Ferndale next February. And then it will start all over again. Don't you just love it. What is this about? Well, anyone who knows me, knows how long I have been trying to get major groups together on one set of rules. Not "almost" together, but totally and absolutely together. Thanks to tremendous effort by Rick Phillis, Rick Machado, Dan Luna, and Mike Block, a vast community of Fray style racers are now under one banner. The Fray International Rules. Hallelujah! Why this name? Because the first race with these kinds of cars was The Fray in Ferndale, and "fray" has become a generic term for this kind race, just as "scotch" is the term used for all cellophane tapes. We all know what it means. Why is this so important? Well, what if you owned a car that was one of a kind. No bolt would fit any other car, nor would any other bolt fit your car. Same with a computer. You have a slot in yours that is unique, and nothing else will fit, except one type. Not very practical, is it? This is the spirit that went into this endeavor. And it WAS an endeavor. A lot of hours and phone calls, and emails over a seven day period, to get a document that may well be the Constitution for slot car racing. It is short, concise, perfect, and lasting. No more doubt about what is legal. It's stated clearly. Let me add one other thing. The Preamble that will be included in each clubs rules will state clearly that, "If it isn't in the rules, it isn't OK". You may push the limit, but if you come in with something exotic, or something that gives you too large an advantage, count on being disqualified. That's how it should be. It's about driving, and tuning. If you can do that, you have a chance. Slot Car Bob shared this with me. It gives a little background on the beginnings of the fray in Ferndale. I emailed Slot Car Bob directly and asked if crediting him as a co-founder of the fray was correct. His response was converted to a word perfect document and here it is, verbatim. Here is the story, as I have put it together. In 1987, I met Rick Phillis, through Ken Shapiro (HO-USA) in Baltimore (That is a great story in itself). I called Rick, and we talked. Three months later, while sitting in my opened garage, working on my 4 X 8, 2 lane course, I feel a body behind me. I look down, and see boots. I follow it six feet three inches up to a grinning face in a cowboy hat. "That's not what you want. THIS is what you want", and he tosses a picture of his 6-lane 12 X 6 foot track. I immediately go about gathering all the L&J I can, and in a few months, I have my own 6-lane. From then, till about 1996, the towns of Petaluma and Ferndale had a semi-annual race called "The Invitational" where we compete in a Fray Style race, for the Turf and Talon Award (Petaluma is famous for chickens; Ferndale for dairy). The cars evolve from the days when we used Aj's rears, and skinny fronts, and the competition is almost contentious. This is where the story becomes a third party affair. I am told that because I disqualified cars with spring spacers in their front ends, that one Ferndale racer asked if this annual race could be changed to a bigger area race, with Ferndale in control of the rules. Phillis calls me and asks what I think of a race with people from other cities, maybe four teams, and two tables. I say sure, let's do it. We had figured that two from the SF Bay, and two from the North Coast would be perfect. But, as Phillis started asking, he realized there was much more interest than just the 4 teams. After about 2 months, he calls me and tells me that he has 8 teams, and is ready to build 4 tables (He had/has a PILE of L&J). I begin to promote it, in HO-USA and my HO Slots of Petaluma web page, as The Fray in Ferndale. For the next several years, Phillis, I, Machado, and others, tour the country, promoting the style of race, and it catches on like wild fire. The rest is history. If you ask me what the short version is, I would say it goes something like this. 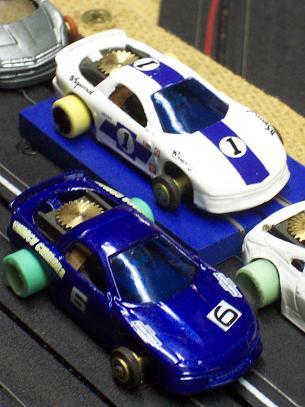 Rick Phillis is the absolute god-father of this race, and because of it, Thunderjets, and HO slot racing in general, has widened interest all around the world. There is no better race, there is no better competition, there is nothing driving the hobby more, nor is anyone else capable of having such a race, due to the effort of Rick Phillis. He has plainly and simply put this hobby on the map. For me, I was there at the beginning, I named the race, and I may have had something to do with the promotion, but I am not an integral part of setting up and running the race. Rick Machado, and various others are a far greater asset to putting on the race, with all their behind the scenes efforts.